You know how there are Crazy Cat Ladies*? I think I’ve turned into Crazy Hobby Lady. Since starting my Frayed Apron Etsy shop and granola business, I spend all waking hours obsessing and tinkering with them. Even when I get into bed after a long day, my mind continues processing ideas about a mile a minute. Last night at 12:30am (long after the rest of my family had fallen asleep), I had a laundry list of thoughts running through my brain. Design newsletter! Print thank you cards! Mail packages! It is invigorating and quite exhausting, and I need to force myself to take a little break every once in a while to a modicum of sanity. Why don’t you all relax with a nice Memorial Day weekend breakfast with me? This French toast bake comes from All Recipes, and ended up being a big hit in our house. It is easy to throw together the night before, and makes a fantastic Sunday morning brunch. The original recipe calls for cream cheese and copious amounts of sugar, which I omitted. For a more indulgent breakfast, feel free to put those ingredients into yours. * My apologies to any Crazy Cat Lady readers out there who may take offense at the label. Although if you fall into that category, you probably don’t read this blog anyway. Lightly grease a 9×13 inch baking dish. Arrange half the bread cubes in the dish. 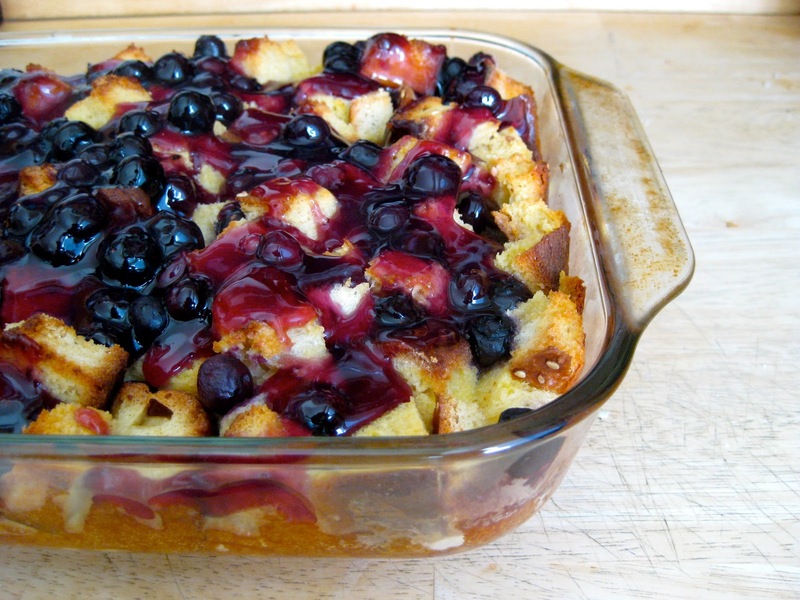 Sprinkle 1 cup blueberries, and top with remaining bread cubes. In a large bowl, mix the eggs, milk, vanilla extract, and syrup. Pour over the bread cubes. Cover, and refrigerate overnight. Remove the bread cube mixture from the refrigerator about 30 minutes before baking. Preheat the oven to 350 degrees. Cover, and bake for 30 minutes. Uncover, and continue baking 25 to 30 minutes, until center is firm and surface is lightly browned. In a medium saucepan, mix the sugar, cornstarch, and water. Bring to a boil. Stirring constantly, cook 3 to 4 minutes. Mix in the remaining 1 cup blueberries. Reduce heat, and simmer 10 minutes, until the blueberries burst. Stir in the butter, and pour over the baked French toast. New Project Revealed: Frayed Apron Granola!